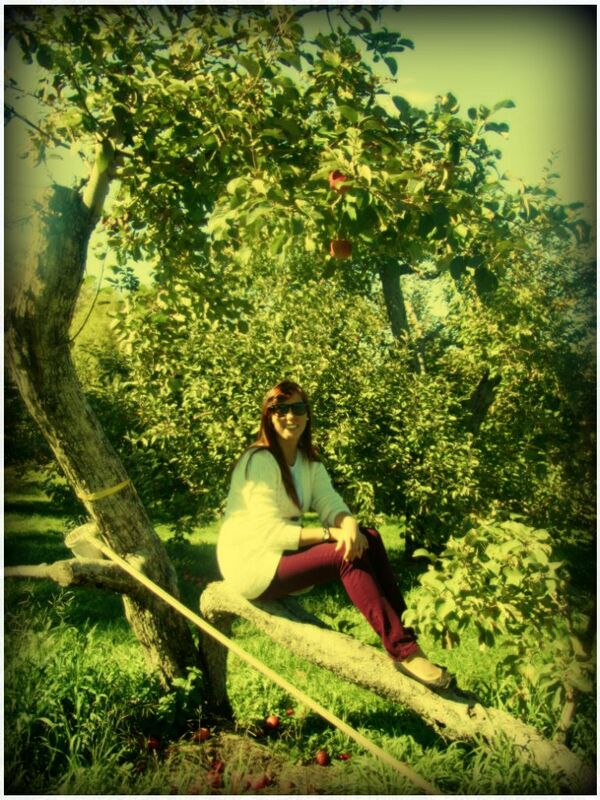 Apple picking season is slowly coming to a close, but I made sure to take advantage of it before it was over! This past Monday, I headed to the local apple orchard in Orleans. 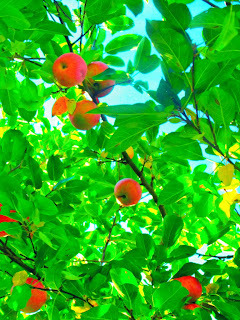 The sun was shining, the sky was blue and the apples were calling my name! 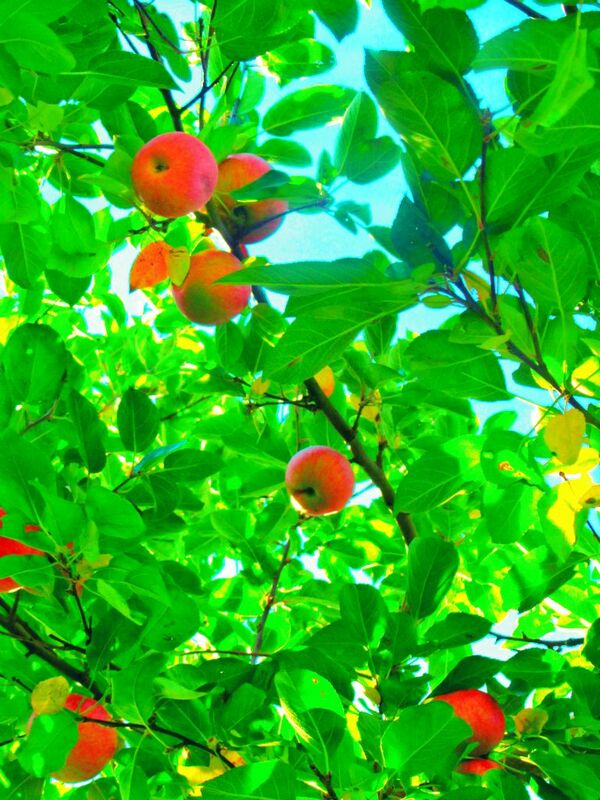 With my apple picking stick in hand, I ventured throughout the orchard picking apples high and low. Once I had chosen my prize-winning apples, I made my way to the front of the orchard and was greeted with a glass of homemade apple cider. The cider was amazing and it definitely hit the spot! After paying for my bounty, I headed home to begin my apple adventures! Once I arrived home, I opened my bag of apples and thought about what to make. Since I love all things apple, it was hard to decide on one thing, so I choose five! I decided to make a traditional apple pie, apple crisp, mulled apple cider, soft apple hermit cookies and apple sauce! Also, that night for dinner, I made a special maple-rosemary apple sauce to go with the leftover Thanksgiving turkey. To begin, I started with the apple pie. I decided to make a traditional, no-frills, pie to allow all of the flavour of the apples to really shine through! I also made the pie crust from scratch, instead of buying a pre-made crust, because let's be honest, it is so much better! But luckily, I have a very handy-dandy apple peeler/corer/slicer, and so the extra time I spent on the crust, I was able to save while prepping the apples. In the end, the pie turned out great....the apples were rich and moist, and the crust was soft and flaky. I used a recipe from the Canadian Living website, entitled 'Grandma Thompson's Prize-Winning Apple Pie.' When I saw 'prize-winning', I knew it had to be good! You can find the recipe at the following link: http://www.canadianliving.com/food/grandma_thompsons_prize_winning_apple_pie.php. Next up was the apple crisp. You can never go wrong with apple crisp. Also, it is extremely easy to make and takes very little time. Since my apples were already prepped, all I needed to do was mix the apples with some cinnamon and sugar, and then combine the ingredients for the topping. I also threw in oats and walnuts in the topping, which I think gives it that extra kick! For the exact recipe, you can find it here: http://www.cookingnook.com/apple-crisp-recipe.html. While the apple crisp was baking in the oven, I went to work on the mulled apple cider. Again this is very easy recipe to make and requires very little effort. You basically just heat up apple cider in a saucepan and mix in a variety of spices and simmer over low heat for 20 minutes. The process may be simple, but the end result is divine. There is nothing better than a cup of hot apple cider! To recreate this heavenly drink, click here: http://www.simplyrecipes.com/recipes/hot_mulled_cider/. After this, I went to work on the Soft Apple Hermit Cookies. These are fairly healthy as far as cookies go, since they call for Splenda instead of sugar. They are also filled with lots of other good stuff, such as raisins, walnuts, cinnamon, molasses, and apples of course! After they are baked, the cookies smell amazing and they taste just as good! The soft texture and spicy flavours are a real treat for the mouth! This recipe can be found on the Splenda website: https://www.splenda.ca/recipes/soft-apple-hermits-cookies. Finally, the last recipe that I made was good old-fashioned apple sauce. In a saucepan, I combined 4 apples (peeled, cored, chopped), 1/4 cup of sugar, 3/4 cup of water and 1/2 teaspoon of cinnamon. I covered the pan, and cooked over medium heat for 20 minutes. After I allowed the apples to cool, I mashed them with a fork, stirred the mixture, and voila, I had apple sauce! If you've never made your own apple sauce before, I definitely recommend that you try it. It's simple, fast and easy, and homemade apple sauce is ten times better than store-bought brands! Now my apple-inspired day was almost over, but I decided to whip up one last apple creation for dinner. Since Thanksgiving dinner was the night before, I had lots of leftover turkey. So instead of eating it with the traditional gravy, I chose to make a maple-rosemary apple glaze. After chopping 2 peeled and cored apples, I heated them up in a saucepan over medium heat. Once the apples were soft, I added in 2 tbsp of maple syrup, 1 tbsp of fresh chopped rosemary and 1/4 tsp of allspice. I cooked this on low heat for 10 minutes, and then served it over my turkey. It was great addition to the meal and paired quite nicely with the turkey. I also used the same maple-rosemary garnish for my sweet potatoes, which turned out superbly! And that brings us to the end of my apple day! As you can tell, I love apples and everything that you can make with them. 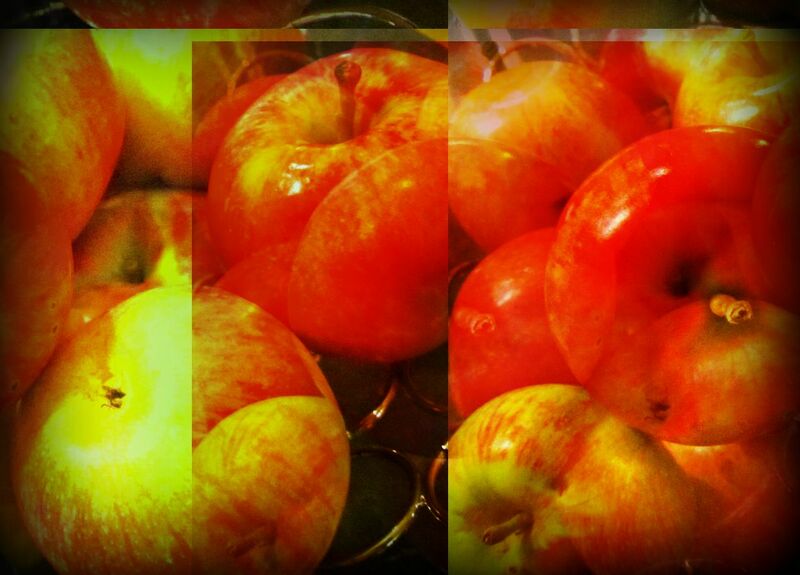 I hope that I have inspired you to create a new apple-infused dessert or meal! I found this web site as a best web site for most up-to-date updates.